A share certificate is a proof of investment that could possibly run into lacs and crores at times. Over time, it goes on multiplying further too. However, due to some unavoidable reasons, one may lose it or misplace it; and it becomes a huge concern. However, there are procedures to follow and a duplicate share certificate could be issued to you. The first and formal requirement is to lodge and F.I.R (first information report) at the police station. The next thing to do is to write to the company along with the original copy of the F.I.R. This is a standard requirement in order to stop any transfer that might take place. Once the company receives the documents and the signature is verified, it will go ahead and stop the transfer. To get a duplicate share certificate, the following are the complete requirements that are to be made when a Share certificate is Lost. A photocopy of the F.I.R has to be enclosed. 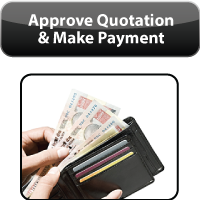 An Indemnity Bond executed on Non-Judicial Stamp Paper of Rs.100/. An Affidavit executed on Non-Judicial Stamp Paper of Rs.10/. An advertisement has to be placed in the newspaper. This again, is part of the procedures. There are companies which will take the ad charges and place the ad on your behalf. This charge may vary from company to company. 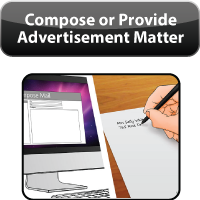 Or, at times, company may allow the share holder to publish the ad on his own after obtaining the ad format from the concerned company. Then, the copy of the ad is sent to the company as a proof. Once this procedure is completed, a duplicate share certificate is issued to the shareholder (if there is no objection to the same within the time frame mentioned in the public notice). While looking for to place the ad in the newspaper, the most important are the cost factor, the ad design, creativity and the type of ads (Classified and display classified ads etc). 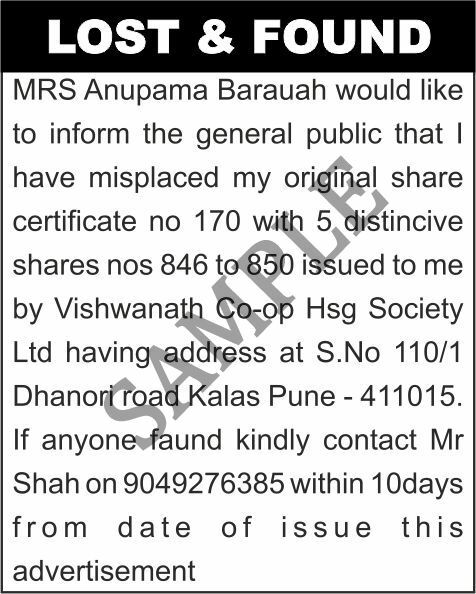 For your lost share certificate ads, you can E-mail us on publicnoticeadvt@gmail.com or call us on 9821254000 / 022-67707001/ 022-67707002 / 3. We will be glad to assist you. 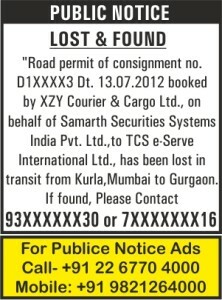 The above public notice ad is for Lost & Found category in a newspaper. A lost thing or a product can be anything. The above ad makes a general mention to the public about Share certificates that have been lost. The ad also says about the Issuer, and in whose name the share is issued. The most important feature of the ad being that it has mentioned the contact person's name and phone number and the time period.